Helena Reynolds will do anything to escape her life in London, even if that means traveling to a remote cliffside estate on the North Devon coast and marrying a complete stranger. But Greyfriar’s Abbey isn't the sort of refuge she imagined. And ex-army captain Justin Thornhill—though he may be tall, dark, and devastatingly handsome—is anything but a romantic hero. Justin has spent the last two decades making his fortune, settling scores, and suffering a prolonged period of torture in an Indian prison. Now, he needs someone to smooth the way for him with the villagers. Someone to manage his household—and warm his bed on occasion. What he needs, in short, is a wife and a matrimonial advertisement seems the perfect way to acquire one. 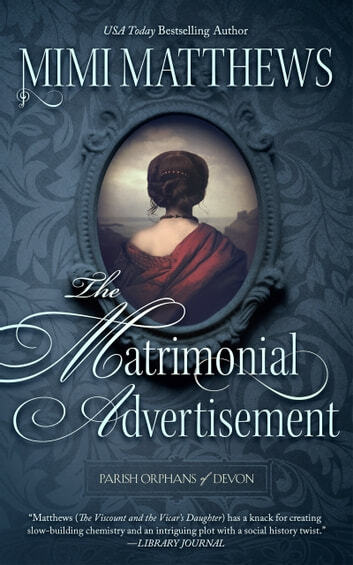 The cover of The Matrimonial Advertisement is elegant and breathtaking. The book description left me intrigued and impatiently waiting for the release date to arrive. Mimi Matthews did a great job at plucking me from my favorite armchair and placing my feet on the cliffside of the North Devon coast and in the rooms of the abbey. Her attention to detail and world-building drew me in from the beginning. (A must for me as a reader.) Romance novels aren’t my usual choice when I’m on the hunt for a book. Don’t get me wrong I do enjoy romance in a book, but I want there to be more going on than a love story. The heroine, Helena, I adored from the first few pages. As for the ex-army captain, Justin, I appreciated that he wasn’t the flawless male character romance novels often portray. This outlook Ms. Matthews took along with the added tension of Helena’s uncle and the setting won me on this book. I'd read more from this author in the future. Every so often I crave a really good romance. I am picky about the romance novels I read. They need to have substance, a great setting (preferably historical), and believable and flawed characters. The Matrimonial Advertisement had all this and more! I was immediately drawn into the story and basically devoured this book. The interaction and dialogue between Helena and Justin was intelligent and set the tone for their relationship. I love a romance where there is both physical and emotional tension between the main characters without resorting to explicit and immediate love scenes. Instead, the author built this romantic liaison between two complex characters with dark and heavy secrets. Furthermore, the topics of their past were not only intriguing but very different from the common damsel in distress and dashing rich hero. Without disclosing what they are as this will give away some of the plot, these are topics that interest me and learning about them from a historical point of view truly fascinated me. So I felt this book was much more than just a romance. It had a good plot, well-developed main characters and also good secondary characters. I was thrilled to learn that this is the first book in the Parish Orphans of Devon series. And for those of you who love clean well-written historical romance, this is it. The book cover too was well done, different from most romance novels out there. 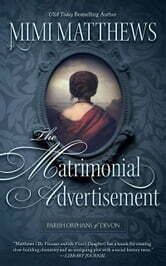 The Matrimonial Advertisement was a satisfying read and I will be looking out for more books by Mimi Matthews! I am now a fan and will count this book among my favorites this year. Great book from start to finish! Kept me engaged throughout.